Not all homes and bedrooms are ideal for senior citizen use. This is because a lot of the simple activities that we take for granted in childhood and adulthood can become increasingly difficult with old age. Whether it’s because of a disease, a chronic injury, or the ravages of time, even moving around the room can pose a challenge for some senior citizens. If you want to create a fully safe and comfortable room in your home for either grandma or grandpa, there are some important factors that you need to consider first. Make it easier on your senior by selecting a room on the ground floor. The less stairs and rises that they have to worry about, the better. In fact, any stairs or level changes between the front door and the senior bedroom should be eliminated using ramps, especially if they need a wheelchair to move around. If not, you can just install handrails/grab bars for added safety while crossing steps or level changes. If there’s no room on the first floor for a senior bedroom, you can place it on the higher floors of your home, provided you also install a stairlift or a chairlift so they won’t have to use the stairs. 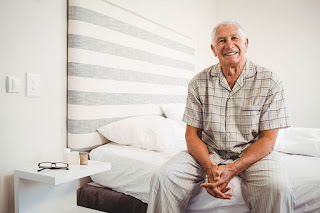 Providing your senior with easy access to their bedroom is not just for comfort, it’s also safer as it greatly lessens the chances of injury at home. There should be nothing in the bedroom that can potentially fall and cause accidents. The floors of the room should be clear, and the bedroom essentials (mattress, dresser, medicine cabinet, etc.) should be easily accessible without having to hop over some clutter. The cleaner and simpler the bedroom, the safer it is. Whether you’re planning to furnish the room with a brand new mattress or an old one at home, hygiene comes first. The last thing you want is to let grandma/grandpa sleep on a moldy or dust mite infested mattress, possibly exacerbating any existing medical conditions. Before you set it on the stable bed frame you’ve picked for the room, make sure that your mattress is 100% clean. Before putting on fresh sheets, wrap the bed in a waterproof mattress protector for best results. Another important concern is the firmness of the mattress. Apart from your senior’s personal preferences, you should also consult their attending physician as to what kind of bed is most ideal for their patient. Those with chronic back problems are usually advised to get a firm mattress that offers full back and body support. Don’t let your senior sleep on an old, busted spring mattress that’s more suited for the landfill or home DIY projects. If the bedroom is big enough for more than a bed and a dresser, then it might be big enough to include an area for exercise. Depending on how fit the senior is, there are a bunch of exercising options that you can make available right in the comfort of their bedroom. From elliptical trainers to resistance-training bands, any low-impact exercise can increase the senior’s health and mobility with minimal risk of injury. Install more lighting options inside the bedroom to make up for your senior’s poorer eyesight. Even if their eyes are perfectly fine, better lighting will allow them to better see obstacles or find stuff that they’ve dropped on the floor. Also, depending on your location, make sure that there’s a working air-conditioner, electric fan, or heater in the room. If uncomfortable temperatures make it hard for us kids and adults to sleep, imagine how much harder it is for senior citizens. What’s even more ideal is for your senior to have their own bathroom attached to the bedroom. Again, the less they have to move around, the less chances of any injury occurring at home. The nearest bathroom, like the bedroom, should also be cleared of any unnecessary clutter as well as any objects that might fall and cause accidents. Grab bars should be installed near the toilet for easier maneuvering, and if your budget allows, consider installing an elevated toilet. Cover the floor with generous patches of anti-slip pads. Place additional lighting in the bathroom. Even the simplest changes can make any bedroom/bathroom much safer for senior citizens. “Making Your Home Senior Friendly,” National Aging In Place Council.